Photo: Mayfair, 508 North Howard Street, 2013. 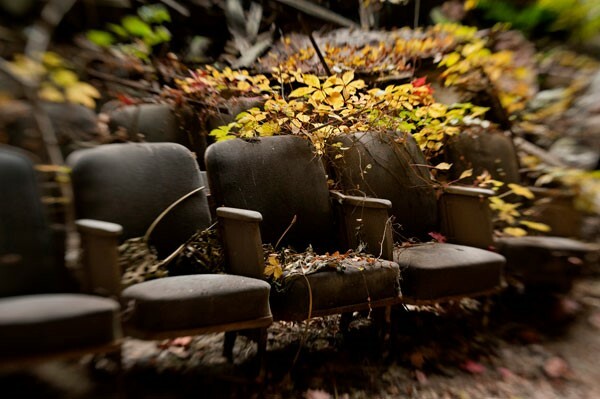 Nature reclaims the Mayfair Theater. Photograph by Amy Davis. Used with permission. RSVP to Emma Filar at efilar@nbm.org. Space is limited. On November 17, the National Building Museum opens Flickering Treasures: Rediscovering Baltimore’s Forgotten Movie Theaters. Explore over 100 years of going to the movies, through photos by award-winning Baltimore Sun photojournalist Amy Davis, as well as architectural fragments, archival images, theater ephemera, and personal stories. Flickering Treasures is open through October 14, 2019. Since the arrival of its first nickelodeon, Baltimore, Maryland has been home to more than 240 movie theaters. Around the turn of the 20th century, moviegoing emerged as a popular pastime for millions, triggering a boom in theater conversions and construction. Architects like Thomas W. Lamb, John Eberson, and Baltimore architect John J. Zink made names for themselves designing opulent movie palaces. Yet, after World War II, social and technological advances contributed to a gradual, and then precipitous, decline in moviegoing. Today, many theater buildings survive but only a handful still screen movies. In the past few decades, significant investment has supported the preservation of several landmarks like the Hippodrome and the Parkway. Flickering Treasures tells a national story of technological change, suburbanization, and racial segregation—all through the lens of going to the movies in Baltimore. Images are available at go.nbm.org/flickeringtreasurespress. Caption and crediting information is provided in the same folder. The National Building Museum inspires curiosity about the world we design and build. We believe that understanding the history and impact of architecture, engineering, landscape architecture, construction, and design is important for all ages. Through exhibitions and educational programs, we show how the built world has power to shape our lives, communities, and futures. Public inquiries: 202.272.2448 or visit www.nbm.org. Connect with us on Twitter, Facebook, and Instagram.